Put your hands up if you’ve made mini puff pastry quiches before? Thought so! They’re quite a popular quick, easy, finger food. I only have one 12 pan muffin tray so I made mine in two batches. Grease the tray(s). Pre-heat oven to 180’ C (fan forced). I cut circles of pastry using a mug but you could be more sophisticated and used a cookie cutter or egg ring. Place each circle in a muffin tray well. Beat the eggs and cream together, then add the remaining ingredients. Divide the egg mixture between the pastry cases and bake until cooked (roughly 15 minutes). These are great eaten hot, cold or lukewarm! 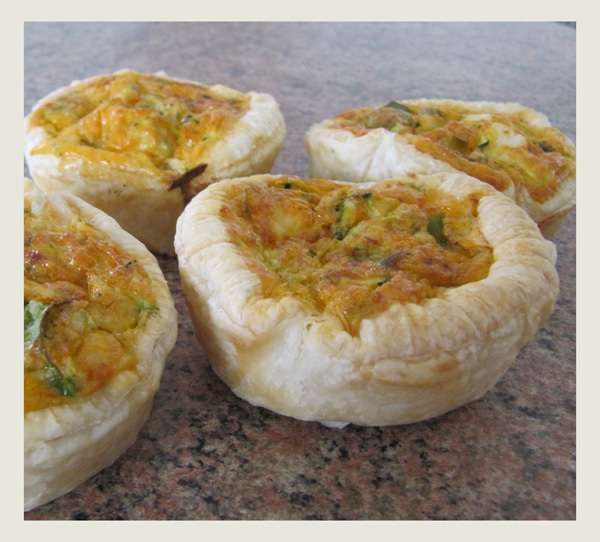 My favourite thing about mini quiches is the variety you can come up with. My personal favourite is ham, spring onion and wholegrain mustard. Tasty!